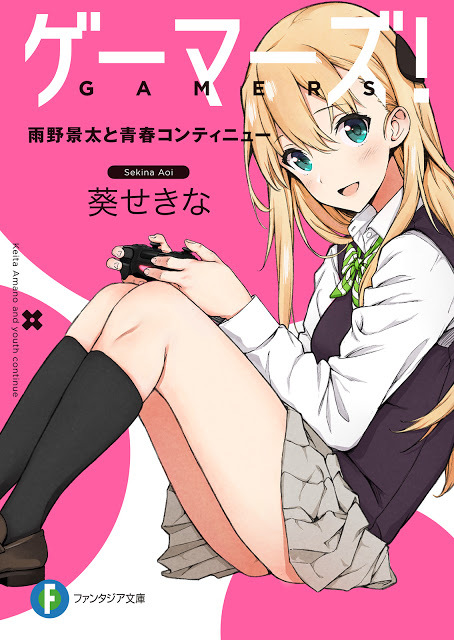 The romantic comedy light novel series centers on the gaming lives of various high school students who play video games, including: Keita Amano, a lonely young man who loves video games; Karen Tendō, the beautiful president of the video game club; Chiaki Hoshinomori, who constantly fights with Keita; and Tasuku Uehara, who puts on a facade of being satisfied with his life in the real world, but he in truth loves video games. One might assume the prologue where the MC monologues on his normality is unnecessary fluff, but this couldn't be farther from the truth. While it does little to define the character - that mostly occurs in ch 1 - it quite adequately sums up the story. This is a serious attempt at exploring what happens when you put a person with no business being the MC in the role of being an MC. Using gaming as a fulcrum, the MC is lunged into love comedy-esque developments that his overall personality... more>> (e.g. Introversion, low self-esteem, etc.) simply can't keep up with. Misunderstandings ensue. So yes, there's some drama, but it's the funny kind of drama. The stupid kind where you say you're going first and then another guy goes "But I want to go second!" The characters more-or-less struggle for the same end goal, but through a combination of miscommunication, their own quirks, and certain love comedy contrivances (which I stress is not necessarily a bad thing), the characters miss the fact that they're on the same team leaving the reader to stare blankly wondering "How did that happen?" The drama never feels too serious as characters (or at least the MC's friend who seems to be the most savvy) are aware of how ridiculous some of these developments can get, and no one's feelings have been hurt thus far. At the very least, everybody only has the best intentions for each other. This novel is surprisingly refreshing and is honestly one of the best Japanese Light Novels I have ever read. While the premise initially seems generic from the title, it's actually quite captivating and all of the characters are extremely well portrayed and interesting. I picked this up a few weeks ago and since then this has become one of my favorite series. I can't wait until more of it is translated. The quality of both of the translations are great so I really recommend this one. The protagonists are really insightful... more>> and refreshing. No derpiness involved at all and the misunderstandings are never annoying, only hilarious when they happen. This is a solid 5/5 stars, one of the most well-written novels I've ever read. Also, another plus is that the chapters are REALLY long so there's actually already lots of content and it's all at a really high quality, so I'm a huge fan of that. Edit: This is a really creative and innovative novel IMO even if it is actually an oldie. This is so godly. I just finished volume 2. I can't wait for Volume 3. This is one of the best light novels I've ever read. Good lord lolol. I literally died laughing at the end of volume 2. This author is a troll (in a good way).